Apple Store armed robbery try turns deadly in So. Calif.
(CBS/KFMB) CHULA VISTA, Calif. - Two suspects involved in a Chula Vista shooting Monday morning were taken into custody after a car crash, and a third suspect is dead. A man and woman, believed to be in their 20s, were arrested after a smash and grab robbery attempt and shooting at the Apple Store in the Otay Ranch Town Center shortly before 7 a.m. A third suspect was shot and killed inside the store by a security guard, according to CBS affiliate KFMB. The three reportedly pulled out guns when they tried to rob the store. After shots were fired, two suspects fled in a Lexus and eventually crashed at the mall. They took off on foot, but were chased down by police, KFMB reported. 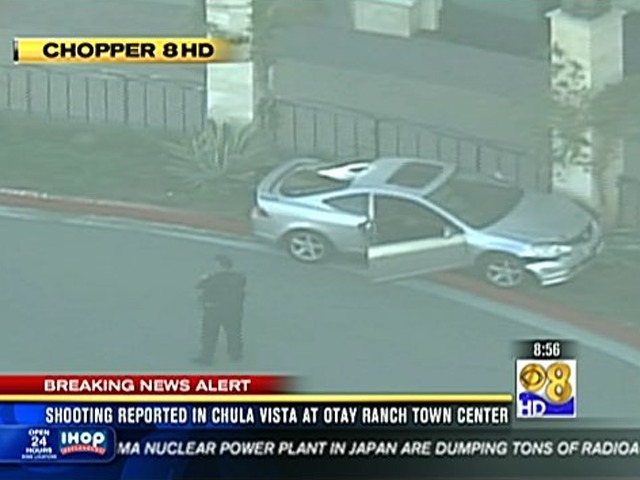 Police said the trio broke into the store at the Otay Ranch Town Center just before 7 a.m., said police Capt. Gary Ficacci, according to the San Diego Union Tribune. The security guard told officers he was in his vehicle outside the business when he saw two men and a woman smash the store's front windows, Ficacci said. The store manager was inside. The guard confronted them and at least one of the men took out a handgun and threatened him, and a gun battle ensued, Ficacci said, the newspaper reported. The trio then got into a small car and started to drive away but the male driver was mortally wounded and the car crashed into a light pole, according to the Union Tribune. The other man and the woman got out of the car and ran. They were found about 8 a.m. hiding on a patio in a residential neighborhood across the street, Ficacci said.